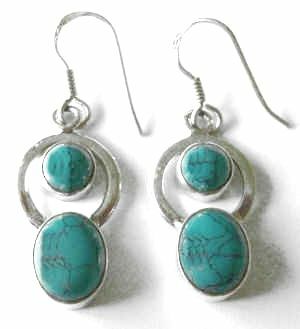 These earrings are a made up of two lovely turquoise stones. One is a nice sized oval stone 10mm x 8mm and the little stone is 6mm. Both stones have beautiful natural grey veining. The earrings are set in lovely silver which is nicely simple and plain, with a pretty extra ring of silver floating around the smaller stone. The simpleness of this piece of jewellery makes it easily wearable whether at work or play.